First Female Governor in Nigeria? The people of Taraba state may have elected a female governor this weekend. Still waiting to see if INEC ratifies the elections but I’ll jump the gun anyways and say congratulations to Governor- Elect Hajia Aisha Jummai Al-Hassan. 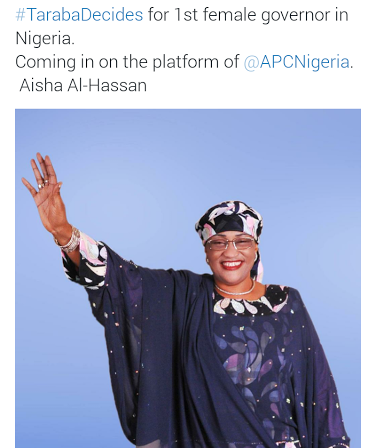 The Nigerian blogs are on fire because many Nigerians are excited to finally have an elected female governor? For those who don’t know, Taraba state is in the North Eastern part of Nigeria, bordered by Plateau and Benue State on the West and on the east by Cameroon. 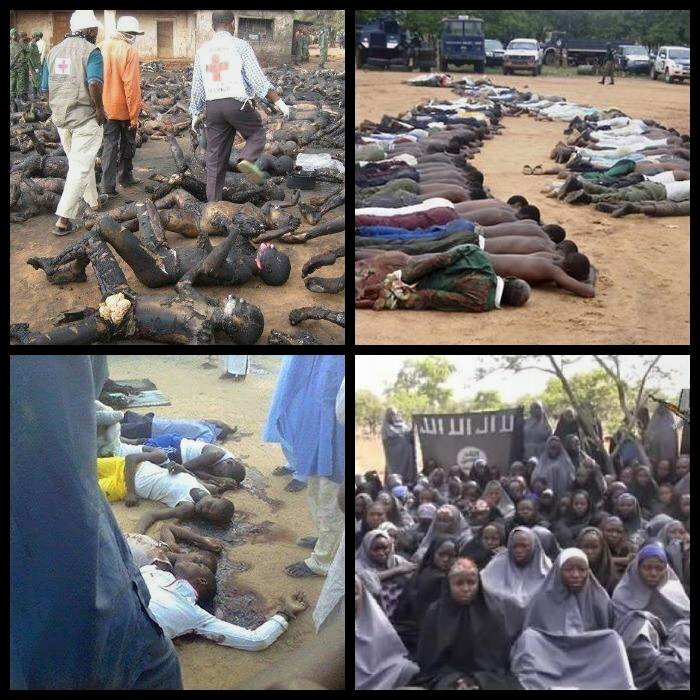 Taraba state is also one of the states where Boko Haram has been active. It is fitting that the people of Taraba state by electing a female governor gave an electoral middle-finger to and shut up Boko Haram as well as those who through their stereotypes and ignorance minimize the roles of women. Potential governor-elect Aisha Jummai Al-Hassan is not a political novice riding the coat-tails of a father or a husband, she is a former senator and a lawyer. She has a history of reaching across religious lines which is important in Nigeria. Some Nigerian men have been posting stupid nonsense about “tokenism.” Curiously, many of these men are from the southern part of Nigeria and likely do not know anything about potential Governor-elect Aisha Jummai Al-Hassan or Taraba state. 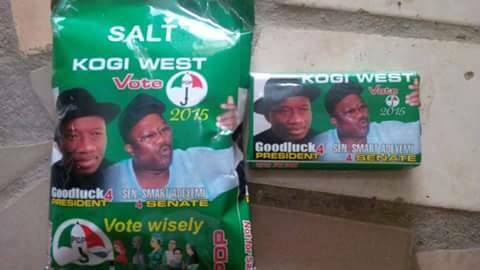 They do not understand how the people of Taraba state could potentially elect the most qualified candidate. In their evaluation a woman could never be the most qualified candidate. These good educated men continue to create barriers for women in Nigeria hiding behind their words and spewing misinformation, and sexism. But this is a time for celebration and there is work to be done. The people of Taraba state spoke out loud and clearly. Even if the INEC ratified data shows that she lost, Taraba state still won as a woman competed fairly. Congratulations to them. Hopefully the rest of the nation can catch up soon. I must confess that I am a forgiving person. Being born in Nigeria, I was taught to forgive people as soon as they apologized. If they prostrated themselves and said “e pele” and “e ma bi nu”, it was quite criminal not to forgive. 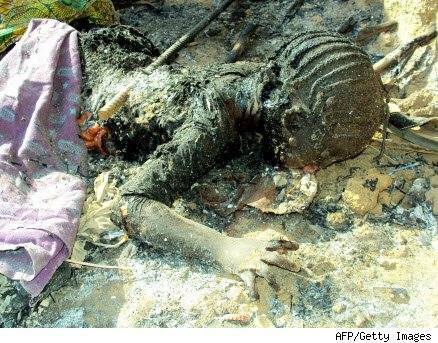 Ironically it seems that forgiveness in the Nigerian collective is inversely proportional to the crime. A petty thief is easy dispatched by a mob for stealing a phone or recharge card. A government banker who steals millions from pension funds is, our son, the future senator, worthy of protection at any cost. 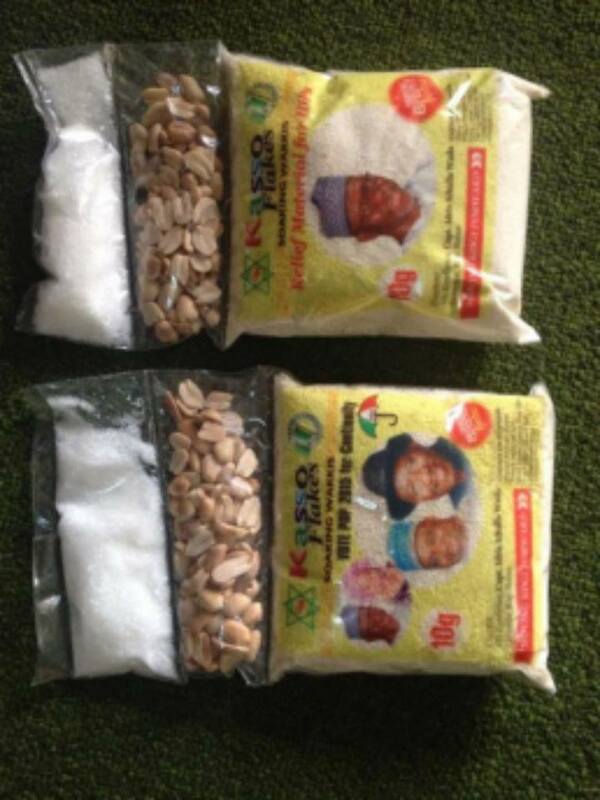 An election is not seen as an opportunity to reward or punish a corrupt official, but as a chance to ride in private jets and collect ‘free’ bags of rice, chicken, shoes, or recharge cards. People mortgage their futures for petty gifts. People love to pray for change but will those with valid PVCs please raise their hands? Elections offer the opportunity to kick out officials who fail to deliver and replace them with someone else. That’s the main power of any democracy. If elected officials know that there is no consequence to their incompetence and neglect what incentive do they have to do better? So here I am sitting through another talk listening to studies about tropical diseases good science from all the world including some impressive science from the continent. I will not say much about the scientists but let’s get to the funders. It is interesting that in almost every nation from small islands to big subcontinents, rich people set up institutes and foundations to do good research. Conspicuously absent from the list of donors are billionaires from the country with a third of most of the NTDs. I would like to say, put your $$ forward, but I guess to each their own.